Will You Get Behind Us? Almost two years after the Jobstown protest the first false imprisonment trial will start on Monday in the Children’s Court where a 17-year-old, who recently completed his Leaving Cert, faces imprisonment. “An injury to one is an injury to all” – so goes the old union slogan. It is a principle which #JobstownNotGuilty is appealing to, as we seek to rally opposition to a major threatened injustice next week. On November 15, 2014, then Tanaiste and leader of the Labour Party, Joan Burton was met by a spontaneous protest in Jobstown. The protest grew to hundreds of people, as a community ravaged by the impact of austerity and betrayed by the Labour Party came out to make their voice heard. 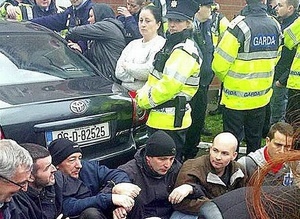 A sit-down protest behind her car, which was parked beside a food bank took place, followed by another sit-down protest and slow march in front of a Garda jeep that Ms Burton was moved into. In total, the protest went on for about two and a half hours. Around the corner, it later emerged, a homeless couple were living in their car for weeks. After almost two eventful years, including two weeks of heavy-handed dawn raids, finding out through the media that we were to be charged with false imprisonment, and the tragic death of one of the accused, the trials are now upon us. The first false imprisonment trial will start on Monday in the Children’s Court, where a 17-year-old young man, who recently completed his Leaving Cert, will stand trial. “It’ll never go to trial” we were all re-assured repeatedly by people incredulous that the definition of false imprisonment could be stretched to include sit-down protests and slow marching. Yet it is. This is not going to stop before Monday. By the end of next week, a young man could be sentenced to jail. Next April, the first group of adult defendants will begin their six-week trial and could face up to life in prison. The total cost to the State of these prosecutions runs into the millions of euros. This is not the first occasion when Ministers were delayed as a result of sit-down protests. Take just one university, University College Dublin (UCD): Taoiseach Charlie Haughey was met by sit-down protests in 1989. In 2002, Minister Noel Dempsey was stuck in a building surrounded by protesting students for hours. Six years later, Brian Lenihan was reportedly ‘blockaded’ by protesting students there again. Not one prosecution for even minor public order offences, never mind false imprisonment, followed any of these protests. What’s so special about Jobstown? It is a working-class community and a protest that has come to symbolise the dramatic shift in Irish politics. That shift is one deeply unfavourable for the traditional establishment parties and the economic elite that they represent. A key part of that change is the refusal of people to play the role allotted to them of ‘waiting in the long grass’ for elections – passively voting for parties like the Labour Party at election time, only to be sold out once again. Instead, the anti-water charges movement was the lightning rod for accumulated anger to explode. The result was widespread civil disobedience, centred in working-class communities like Jobstown. Instead of the caricature of apathy, these communities were central to protests against Ministers, the prevention of the installation of unwanted water meters and, crucially, the 73% refusing to pay water charges bills. Not only widespread civil disobedience, but successful widespread civil disobedience – with the Government forced to suspend water charges and Fianna Fáil forced into opposing them. If you are part of the 1% in this country, with your traditional parties reduced to less than a combined 50% of support and Labour slashed from 37 seats to 7 – this is a very scary vista, considering the number of other issues that social movements are possible on. It is a prospect that requires a strong response from their point of view. That is what explains the reaction of the state. This is a threat not just to the freedom and future of the 17-year-old, or the other 18 defendants.It represents much more than that. It is an attack on the people of Jobstown and Tallaght – punishment for being to the forefront of the movement against austerity. It is an attack on people’s democratic right to elect the TD of their choosing, because I would be removed as a TD if sentenced to more than six months in prison. Most importantly, it is a fundamental attack on people’s right to protest. If sit-down protests are false imprisonment, then there are a lot of potential kidnappers out there. Any striker who mounts an effective picket preventing the movement of vehicle could be guilty. Any anti-war protester who sits down outside Shannon airport could be guilty. Any abortion rights protester who participates in a slow march could be guilty. We all become kidnappers. It sounds farcical, but it is deadly serious. At stake here is people’s right to protest. 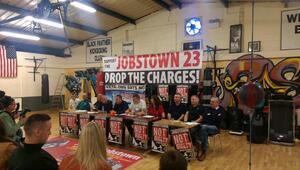 #JobstownNotGuilty was established by the defendants one year ago to co-ordinate a united defence campaign of all. We have been working away on legal and campaign preparations. Now, we are appealing for people to support us and their own rights. Much of the media has already pronounced our guilt, with the tone set from the day of our arrest, with Claire Byrne declaring that “you falsely imprisoned the Tánaiste” and continued famously by Ryan Tubridy on the Late Late Show, not to mention the Sunday Independent. We therefore rely on people themselves connecting with #JobstownNotGuilty and spreading the information about the injustice that is threatened. We need people to pass motions in trade unions, students’ unions and campaign groups. 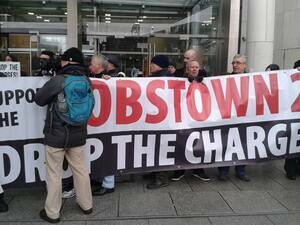 We want other communities to publicly express their solidarity and support for Jobstown. This should become a national scandal – with a demand that the charges be dropped. The 17-year-old is on trial for all of us next week. We have launched a fundraising appeal to raise the €2,000 necessary for bail in case he is jailed, so that he can appeal without being incarcerated. One of our campaign will read out a statement on his behalf at Saturday’s Right2Water march and we will be present with placards and leaflets. Most importantly, we are appealing to people to turn out to the Children’s Court in Smithfield, Dublin 7on Monday morning at 10am for the start of the trial of the 17-year-old. A massive display of solidarity is needed to show that we stand behind him. Posted in Misc and tagged Jobstown, Paul Murphy, Right to protest at 9:17 am on September 16, 2016 by Admin. It would be an injustice if they avoided trial due to Murphy’s political pressure, no? Getting your day in court is justice, no? Oh dear God. You’re just embarrassing yourself now. That doesn’t make any sense at all but good to know you’re reading. It’s a quote. From you as it happens. I love moments like this, makes me want to make a fresh cup of tea. Uh huh. That’s why I said ‘good to know you’re reading’. Good lad. Is this who they got in to replace Anne Marie? Replace Anne Marie AND Julian. there should be no power without responsibility. you Paul have power, you used it to cause the disruption that day (abused your power many people think) and you should take responsibility. I wonder how your mam or your dad would have felt if they were in Joan Burton’s position that day? I know I would have found it genuinely unsettling and scary and I’m only about a decade or so older than you. You can soft peddle what you did all you want but I consider what you did unlawful and so do others. man up and take responsibility – sure you’ll get loads more votes if you go down. you are loving the attention. as for your constituents you should offer to pay for them. take responsibility. Now, now… stop that ! That’s it. Now that middle class pretending to be working class gimp is now writing for broadsheet, I’m off. He doesn’t pretend to be from a working class background. You don’t have to be working class to want a better society for working class people. He only wants whats best for him. This is a man that will jump ship to any area he thinks will vote for him. Hes not a td who gives any care to his area, im not talking parish pump, I mean actually caring for his constituents and the country as a whole. He just cares about being a mouth piece to get elected. Yeah. I mean, judging by that kind of logic, the tenant class should have told Parnell to feck off because he wasn’t working class. It’s not like anyone in the upper classes has ever wanted to help the working classes, right? Burden of proof is on the state in a criminal trial, so results are not weighted against prosecuted. As such, I’d be very surprised if anyone is found guilty of just a sit down protest. However, if people were throwing objects at police, cars and officials chosen by the people and generally being abusive then it’s a different matter. The point of a trail is to allow the two sides stories be heard in public and see if the truth can emerge. As such, Paul should welcome trail as an opportunity to vindicate the protesters, unless he’s knows that something else will emerge. No, sorry, we don’t put protesters on trial in civilised/non communist countries. I genuinely don’t know what they are formally charged with, but if it is for protesting I’d agree with you. if it is for something else, then the courts will decide.. if they are innocent what’s the problem ? The problem, as I said, is we don’t put protesters on trial in civilised/non communist countries, and that includes inventing charges so it doesn’t look like they’re literally on trial for protesting. This is what’s happening to Ibrahim Halawa in Egypt, which is a military dictatorship. Do you think Ireland should behave like a military dictatorship? Why do you think so little of our country that you would support this? Defo shouldn’t act like Egypt, and think it’s an unfair comparable. He’s been in jail for ages pending trail, whereas guys in this case are free till the trial. Secondly, Ireland has a decent reputation as having an independent court system, whereas I’d suggest that in Egypt it is politically influenced to a high degree. It not like with like. Ibrahim Halawa and Paul Murphy are both on trial for false charges because they took part in a public protest. They very much are like for like. If you like military dictatorships so much, I suggest you move to one and leave Ireland to civilised people, thanks. non fatal offences against the person act. section 15. So you took from my above comment that I love military dictatorships? Kinda believe what you want really, regardless..
You support Ireland behaving like a military dictatorship. It’s not a massive leap to conclude you support actual military dictatorships. Both of those statements are massive leaps. keep throwing the mud to see what sticks. – if they have been accused of a crime, yes we certainly do. If we’re a dictatorship who will reinterpret a false imprisonment law to make examples of people sitting on the road to block a minister’s passage we do but only a shill or an idiot would actually regard that as false imprisonment. So, you concede that sometimes protesters are sometimes put on trial in “in civilised/non communist countries”, then? – strange choice of phrasing, as Paul Murphy’s colleagues would be more than happy to see Ireland turned into a communist country where the govt could seize private property on a whim. No. Really don’t know how you came to that conclusion. Well at least I know now you’re a partisan hack. People aren’t arrested/put on trial for “protesting” in Ireland; however, they may be arrested for some other alleged offence (trespass, public order, what have you). They will still have to be found guilty or not guilty in front of a jury of their peers; the truth will out. Mentioning the case in Egypt, come on. Just go away now. People imprisoned in the likes of China and Russia and Egypt weren’t charged with literal protesting either so your point is redundant. Not even poor people? FFS, what kind of plutocracy are we running here. Even if they’re breaking the law? wow, maybe I’ll protest you with a headbutt safe in the knowledge that you would state it to be an injustice if I was arrested because we don’t arrest protestors. Did Murphy headbutt Joan? Or did he sit on the ground in front of her car? That was stupid, even for you. Well see, the point is that Murphy (at least) isn’t being charged with protesting. He’s being charged with false imprisonment. And that’s a real charge. It’s not been made up just for the purpose of this event, it’s been created under the Non-Fatal Offences Against the Person Act, 1997. Now, I don’t like the notion of protesters being charged either. We’ve seen it time and time again, most recently in the Corrib protests. But most of those charges weren’t for ‘protesting’ either. I think the DPP is wrong in this instance, and hopefully there will be much egg on face. I realise that. I’m being lazy but as far as I’m concerned, it’s effectively the same thing. Sittng down in fromt of a car, one surrounded by cops no less, is just not false imprisonment by any rational interpretation. What happened and the charge that resulted are so spuriously linked as to make the charge, as I said, effectively invented for this. The charge is false imprisonment. Not throwing stones. The charge against Paul Murphy. There are others charged with violent disorder. He has also been granted free legal aid to defend his rights or election campaign …if you prefer. If the rules allow him to have free legal aid, then all the better. If one is innocent until proven guilty, then why should one be forced to pay thousands to have their innocence proven. There’s no refund of fees if you’re found not guilty. They aren’t charged with throwing objects and shouting abuse because those would be offences under the Public Order Act for which they could get a fine in the District Court. Instead they are being charged with false imprisonment under indictment in the Central Criminal Court with the threat of life imprisonment. Good to see Murphy weeding out the partisans here. They can’t help themselves around actual left wingers. He’s right on Apple but Opposition to estate tax and LPT? The left doesn’t begin and end with Trotskyites, pet. You’re a gobsh1te Murphy. There has been no dramatic shift in Irish politics, just Fianna Fail voters voting for Fine Gael and back again. You and your cronies are not the answer and I wish you’d stop claiming to be. No they’re not. What I pointed out was that people would rather vote for the status quo, despite all the damage they’ve caused, than vote for Murphy and his stupid AAA/SWP/PBP buddies. Labour were the realistic alternative until they made the fatal mistake of getting into bed with Fine Gael. If the only options are poor centre right or ridiculous hard left the majority of people will take the lesser evil of FF/FG every time. You have just pointed out that they are actually a much better option…. Good luck in court. 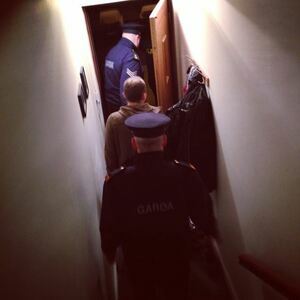 I hope you have every single Garda who stood around and watched this alleged “false imprisonment” called as a witness. Whatever about the rest of the article. I just can’t bring myself to believe a 17 year old could be a gurrier. It’s OUTLANDISH. Sure he’s only out of short pants. No, no, if he’s 17 and especially from a working class area, he’s *definitely* a gurrier who should be locked away so he can’t make posh folks feel emascul…I mean, so he can’t go gurrying around civilised folk. Paul is painting his age as a relevant factor. As though the state were rounding up infants to imprison. Whether it be black people in the states, travellers here or poor people everywhere, the state rounding on the the more vulnerable in society is pretty common so it isn’t exactly far fetched to suggest they’re rounding up kids. Teenagers from Jobstown probably won’t have the best legal team to defend them. But that’s beside the point. The title of this post is “Will you get behind us.” He’s writing this specifically to win support from people. Winning support from people nearly always requires telling a relatable story. In this case it’s about a 17 year old young fella, who is going to find opportunities in life difficult enough to come by as it is, getting a criminal record branded on his forhead and a possible prison sentence for taking part in a sit down protest. But you just want to call him a gurrier. I want to see the evidence before passing a judgement, that’s all. If all he did was engage in a sit down protest, then this is a scandal. If the Guards have evidence, let them prove their case. That’s how we do things like this isn’t it? I find it fascinating that people want to label the 17-year old defendant a gurrier, presumably with their only pieces of evidence being a) that he’s from Jobstown, b) that he was at this protest, and c) that he was arrested. Because I’ve heard him speak twice at rallies. And he’s quite clearly an intelligent, erudite young man who’s a fantastic public speaker, especially when you take his age into account. He’s a far better speaker than many of the adults I’ve seen at water protests. And while I acknowledge that he may not have written the speeches he gave (there’s no evidence that he didn’t, but I know that speeches at rallies are frequently either written or re-written by others), he was still able to read that speech in a confident tone, with no evidence of nerves. Labelling him a guerrier is nothing more than ignorant classism. We don’t charge people taking part in a sit down protest with false imprisonment, no, especially when we have video footage of the whole thing and can actually see what happened. Are you excusing all this because they can defend themselves in court? Nobody labelled him a gurrier, pet. I took issue with Murphy waving his age around as though he was a cherubic little angel, as if it was unheard of for a 17 year old to be before a court. It’s a false premise and a weak argument is all. I’ve no idea what case the guards and DPP think they have, to be honest. But I want evidence of abuse or political interference before I condemn our entire justice system as a plaything of the government of the day. You know, I won’t just take Murphy’s word that we’re living in a dystopic police state. If these prosecutions all fail spectacularly we might have an answer. "I just can’t bring myself to believe a 17 year old could be a gurrier. It’s OUTLANDISH. Sure he’s only out of short pants." Paul Murphy’s charge is false imprisonment. He’s not being charged for assault for something that might have happened off camera. It’s false imprisonment. For sitting down in front of a car. That was surrounded by police officers. And it was all on camera. What type of evidence do you think you’re not seeing which might justify the false imprisonment charge? He got great leaving cert results and a place in college. He has,also won awards for his work in the community. “palpable apoplexy” the new fragrance by givenchy. Wow, there’s a lot of hate on here today. Paul would probably be my TD if I still lived in Dublin, assuming I hadn’t flown far from the nest, and I would be very happy about that. I wholeheartedly agree with him, I think it’s disgraceful that anyone is being charged for sitting down behind a car. Furthermore, it is disgusting, and shows the utter contempt for the people held by those in power that they would go after a minor for such an offence. I truly wish I could be in Dublin on Monday morning because I would be joining those outside the court. Instead I will be supporting the cause as best I can from here. I will in me bumhole get behind you. I think you’re very smart and an opportunist and I don’t buy that you truly believe in your cause. Naah. A bunch of mules were taken off water meter duty to stand around for 2 hours and not do anything about the allegedly incarcerated Ms Burton. Charging anyone with false imprisonment for what went on that day seems ridiculous. I’m not crazy about the idea of a big protest outside the Children’s Court – there will be a lot of vulnerable youths around that day, as well as some urchins who might try to kick things off. “The tragic death of one of the accused”. Was it a suicide? I don’t agree with him but Paul Murphy is a much, much better writer than Anne Marie McNally or Julian Mercelle. Is there any chance he could replace them on Broadsheet? He is a much better writer, I will give him that much. If St. Paul is going to use the political tactic of “ class warfare” , then it is only fair that his own middle-class background is addressed. Let us have some context to his rather astute political game. And not just Murphy’s background. There is the wider question of why are so many middle class people get a hard on for the working class. probably a wish to work towards a more equal society would you not think? You’re middle class? You’re left wing because of self loathing and a need to be liked and right-on. You’re working class? You’re envious of the wealthy’s success and want to knock them down a peg or two. A dehumanising view that anyone advocating for the interests of others must not be genuine, down to the fact that you think inequality is good for you, personally, ignoring the evidence that more equal societies are more prosperous societies. Agree with your sentiments , Ahjaysis…. but do you not think that using class warfare as a political weapon could be viewed as both polarizing and self-serving? So a middle class person of modest means advocates for the lowest rung of the ladder in our society and it’s self serving and polarizing. A middle class person of modest means protects the banks, mortgages the state in their name, implements regressive austerity punishing the poorest in service of the wealthy and it’s what, patriotism? Pragmatism? Shrewd management? 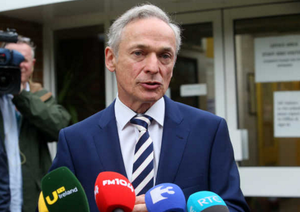 How is Murphy sticking up the poor more dangerous than Noonan sticking up for the rich? Neither belonging to either group? It’s always class warfare when the poor come looking for their share. It’s just normal service resuming when the rich get richer off the backs of the poor. Demolishing their workplace rights, abolishing their pensions, castrating their unions. Do you have to be from a ‘working class’ background to protect the interests of the poorer and more vulnerable in our society? In Britain, Tony Benn was practically aristocracy. In the US, Bernie Sanders isn’t short of a few shillin’s. Parnell was landed gentry and our 1916 martyrs were mostly from the educated set. Fair play to Murphy. I am more interested as to why the Gardai surrounding Joan haven’t been reprimanded for not intervening in an obvious case of false imprisonment. Can you imagine the uproar if the Gardaí went in, truncheons a’swinging? From what I saw of the footage, there weren’t enough Gardaí there to intervene safely. What has his class got to do with his defence of what he perceives as inequality towards the working classes? Agree or don’t agree with him, but why is it necessary that his own background is addressed? I have never understood this point. Projection. He cares about the poor even though he isn’t so selfish pr1cks are *subconsciously* reminded that they’re selfish pr1cks when they see him. But. Rather than engage in introspection and entertain the possibility that they’re wrong about something, their tiny brains prefer to besmirch and cast aspersions about his character and motives because that allows them to reconcile their selfish pr1ckness. If everyone is selfish and uncaring, that makes it ok for *them* to be selfish and uncaring. 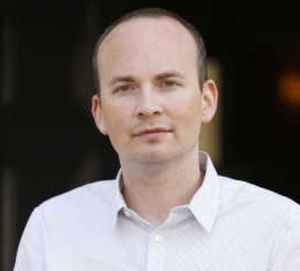 Paul Murphy challenges that in their subconscious so they must attack him. It saddens me that that’s probably accurate, Moyest. But it probably is. Well it is a point made by particularly stupid people. I mean, what’s the upshot of it? He’s only pretending to be motivated by concerns for working class people? But in reality he wants to improve their conditions because… €€€? He’s not concerned about their lives but is using them as a means to achieve his own agenda against the state, in the course of which he will – entirely incidentally – advocate on their behalf? He wants to dedicate his life to enraging other middle class guys and will go to any lengths, up to and including imprisonment, to get them foaming at the mouth online, with the working class merely pawns in his game – albeit pawns who stand to benefit hugely, but pawns nonetheless. So what has Paul achieved apart from scoring an own goal ? If he had campaigned for the introduction of a non-punitive water charge , then I would be happy to applaud the man. Instead, he turned it into some polarising class issue. The water charge is a charge that effects all sections of society. It is not some puerile game of elites v non-elites . In addition to property and inheritance tax, he also does not seem to care too much for the environment. His obsession with class is regressive and only serves to demonise the very communities which he seeks to represent. Being demonised in whose eyes? Yours? Enda Kenny is a country school teacher. What’s he doing lining the pockets of billionaires? People in Tallaght have welcomed him and don’t care what his back ground is. There are people from many different walks of life in the AAA. Paul comes off as an insincere chancer. I’m quite naive and I do’t buy what this guy is selling. If yous, Murphy haters, lived in 60s in the States, you’d have likely pouring scorn over M.L. King and black civil right protesters. Or throwing rotten veg at Vietnam war protesters. Kicking lesser-incomed or oppressed in the head is a lasting fashion of irish middle class. It’s probably the ‘middle’ bit that makes you restless. Inbetweeners. Wealth holders will flush you and your “middle classness” down the toilet the minute your life style endangers their incomes. Don’t get any ideas, you have no special place in their hearts. You’re disposable. Your only excuse for delusion is if you were still in school in 2008. Paul, more power to you. I love human-centric aspiration of the ‘left’ and meritocracy ideals of the ‘right’. If you weren’t around to channel anger into organized protests, there would have been a spiral of violence. So, thank you. So did you all donate? “Most importantly, it is a fundamental attack on people’s right to protest. If sit-down protests are false imprisonment, then there are a lot of potential kidnappers out there. This is a hugely important case. I hope it’s thrown out of court. Of course not. They demand free money. How dare you suggest they give it away? A new iPhone just came out after all.